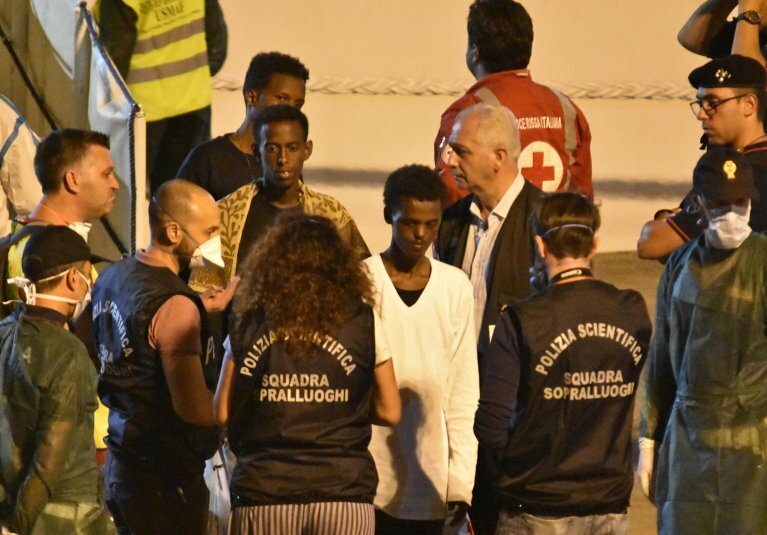 The 27 unaccompanied minors who disembarked the Italian Coast Guard ship Diciotti were "skeletons, tired, exhausted, confused", according to accounts from NGO workers who met them as they landed in Catania. Workers from humanitarian aid NGOs that met 27 unaccompanied minors who disembarked the Italian Coast Guard ship Diciotti at the port of Catania said the children were malnourished "skeletons", some of whom were unable to walk due to pain and one who couldn't see well after having been locked up for a year in the dark. Of the 25 boys and two girls, the thinnest weighed just 30 kilograms. One of the minors had pain in his shoulder because he had been shot during a robbery, while another three were wounded and had rotting bandages around their limbs. Many of the children had scabies, and all were "tired, exhausted, and confused", according to workers from Terre des Hommes (TDH) and Doctors Without Borders (MSF), who met some of the minors when they disembarked in Catania. Most of the children had been held in Libyan detention centres for over a year, where they suffered physical violence and abuse. "We received 27 little skeletons, including two splendid young girls," the TDH worker said. "Last night we were having a lot of trouble with the language. The little ones were all Eritrean, except for one little girl from Somalia," she said. MSF psychologist Nathalie Leiba did manage to speak with some of the children. She was struck by the stories of two young men in particular. "One of them couldn't see well; his pupils were very dilated," she said. "He explained that he had been detained for a year in the dark, suffering abuse and torture, while the Libyans made him call his family in exchange for money," she said. The other story is that of the young man with a shoulder wound. She said the young man told her that traffickers had shot him, because "they were fighting over who should rob this group they were a part of". She said the young man was 15 and had pain in his shoulder and that his hand was retracted. The MSF psychologist said the children are worried about their friends who remained on board. "Of course, keeping people - minors, adults, women - for a long time aboard a ship in conditions of uncertainty, people who have already had difficult experiences of torture and abuse, doesn't help their psychological well-being," she said. The TDH worker said despite the "incredible thinness, scabies, hair matted from salt water, rotting bandages, shot arm, I still thought they were just beautiful". She said, "I can only imagine my dazed expression in the face of such resilience, and above all, the ability to continue to trust another," she said.